Dating back to the time of the Romans, the ancient town of Chartres has a long and rich history. Most of the stories of Chartres, however, are lost in the shadow of its most famous and most prominent landmark – the magnificent Gothic Cathédrale de Notre Dame. 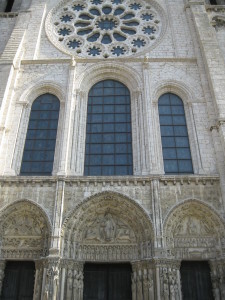 Sited on a hilltop in the centre of Chartres, the cathedral dominates not only the town but the plain that surrounds it. Building began on Notre Dame in 1193 and when it was finally completed in 1250, it was the largest cathedral in France. It still holds that claim. In floor of the cathedral is a beautiful mosaic labyrinth, a typical feature of Gothic places of worship, which has visitors running round in circles as they follow its twists and turns. The most striking features of Notre Dame de Chartres are its exquisite “vitraux” or stained glass windows which feature the incredible bright blue that has come to be known as “chartreuse”. La Cathédrale de Notre Dame de Chartres is a UNESCO World heritage site.